Although any courier bag or backpack is adequate to haul gear while pedaling, once you’ve used a pannier it’s tough to go back. If you’re seeking a saddlebag that does a little bit of everything, have a look at the Novara Commuter Pannier. Novara is the house brand for outdoor giant REI. 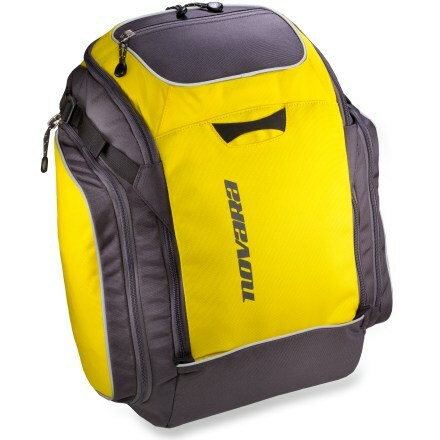 Its pannier is a two-pound bag made from recycled polyester. It costs about $85 and can haul 1,400 cubic inches of stuff (translation: a 12-pack and then some; or a change of clothes, lunch and a laptop with room to spare). I’ve been using the Novara Commuter Pannier for my regular 5.5-mile commute since November. With intuitive design and just enough bells and whistles, it’s a piece of equipment that doesn’t require much thought — just grab it and go. Smartly designed, there’s an external zippered pocket for items you may need quick (cell phone, for example), an internal zippered mesh pocket, and an un-zippered mesh internal pocket. Two external side pockets perform different duties: One holds a raincover and the other has a sleeve for a pump and a multi tool. Abundant reflective piping, a loop for a flashing LED safety light, and a key clip round out the pannier pack. And the clip system on back did a fine of job of keeping the bag secured to my rack (while also allowing fore and aft adjustments). If you’re looking for a pannier for anything short of fully-loaded touring, Novara’s bag is a good option. —Stephen Krcmar bike commutes year-round in Mammoth Lakes, Calif.